Nakfa, Eritrea. Micro dam at the beginning of the rainy season; it’s used for irrigated farming. Increasingly, the threat of environmental degradation has garnered attention as an important developmental issue. Currently, there is a strong consensus that environmental degradation can negatively affect humans and other species, and direct consequences include aspects of global warming, torrential rains or little-to-no rain, and desertification. The potentially devastating consequences of environmental degradation, increasingly associated with human and national security, have given impetus to global efforts for its to remedy through investments and projects. As part of my own work, research, and travels, I have had the opportunity to travel to Eritrea and I witnessed the efforts firsthand, the outcomes of which are evident throughout the country, but particularly in rural, remotest areas. Pic. 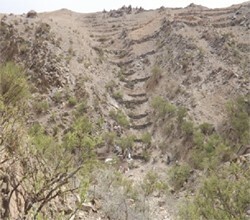 3: Nakfa, Eritrea. Villagers working on the micro dam construction. One such rural, remote area is Nakfa, found in the northern part of the nation. The region was the scene of large-scale destruction during the long struggle for independence, and there are noticeable negative marks of degradation. However, reconstruction of the city and surrounding villages has been ongoing, with the construction of houses, schools, a hospital, and water facilities, in addition to battling environmental degradation. The commitment to development and alleviating environmental degradation risks are illustrated by the accompanying series of photographs (during my extended stay). The photos capture the community, assisted by local authorities, engaged in constructing micro-dams on three tributary rivers: the Feleg, Shakat and MoO, in a bid to capture potential running floods from the upcoming rainy season. Flood retarding terraces were also prepared to reduce clogging from the eroded soil. Pic 4: Nakfa, Eritrea. 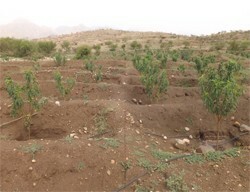 Drip irrigation for reforestation. Of added significance, construction efforts took place in spite of the limited availability of materials, and despite the fact that the majority of the participants were observing the Islamic fasting period. These dams would not only catch water for broad public use, but also enable the recycling of the groundwater – vital to combating degradation. I also observed that the local authorities have introduced a drip irrigation scheme, in order to sustain agriculture and forestation programs in this area, where water is scarce. These efforts, coupled with other projects in forestation and irrigation, will play a critical role in assisting sustainable agriculture and greenery, and transitioning the ecosystem toward a more habitable environment. Here, it is important to understand the priorities and ambition of the local communities in this area, and other developing nations in general, and any governmental or international efforts should center on these considerations. I conclude by reiterating the importance of such endeavors for human and national security: without a healthy, harmonious, and sustainable environment there will be no species, no humans, no villages, and no country. Various stakeholders, the development community, researchers and intellectuals, and relevant organizations should revisit these issues for the sake of regional and global sustainability. [iv] Even when rain occurs, it may flood the land and speed toward a running river or to the sea. Yes, a very, very vital endeavor indeed!! But as every other enemy in the past, this (desertrification) will be defeated as well. We need to protect our existing forest while continued with planting new tree seedlings. So far millions have been planted. Once WE SOLVE energy supply for every home ,and change wood stoves with electric or gas stoves, then people will stop cutting trees. Eritrea, having so much untapped alternative energy sources with its applications on Red sea ,more water could be produced. Encouraging local investors with land lease licenses and loans to set up a company for fire wood production would be a sustainable way of tackling the problem.Profit driven investment could come up with its own way of desalination and irrigation methods faster and efficient with out loosing ower communal way of solving problems. With Sahara desert expanding 20K/M every year is causing problems to the people of the region .We have the obligation to do ower part visa vise encouraging the neighbours to do their part . it is indeed a national security issue the environmental degradation risks need to be dealt with the most effective measures to mitigate its undesirable environmental consequences. forestation not lower carbon dioxide level it also prevent drought. the Eritrea people and government are doing their utmost to prevent and improve the environment by cooperating with international experts. 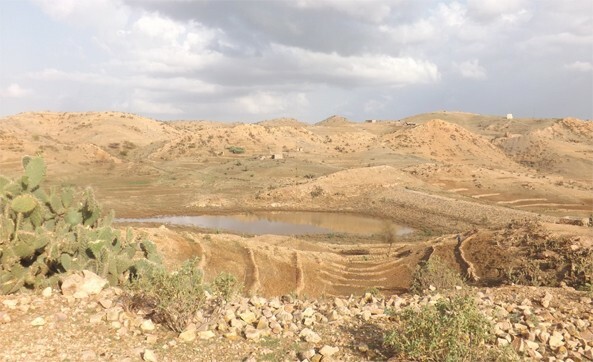 building dams, forestation, terraces irrigation, drip irrigation and other steps measures are taken by Eritrean and people these measures positive outcomes. Eritrea adi hedri its trademark is hard work, environmental issue is like old saying sitch on time save nine. True. The internal efforts should not be ignored as well. Its been almost 20 years since our Gov has started the Summer student program, which mainly aims at planting trees and introducing the youth with different regions of the country . Yes ,students with summer program planted a lot of trees, but there is no flow up watering and taking care of the plants, so ends up loosing most of it. Water irrigation system must be setup on the hills of the country before planting them with clear management system to take responsibility. Another solution is long-term lease for unusable lands of the hills to an interested and innovative individuals or groups from close towns, just for the purpose of investing in forest industry. Thanks for this great article. As population density increases and resources become scares, the impact mining or any development on the environment must be carefully examined. We must look the environment beyond the extraction time of resources through research and learning from the experiences of other countries. Any resources that has been exploiting now, has its own life time. Thus, environment protection is very important through education, innovation, efficient the utilizing the resources. Everywhere you go from the past experiences of developed nation; scarcities of resources have impact on environment, social, economic and political integrity of a given country. So this is my input to my beloved nation Eritrea. All Eritrean weather you live inside or outside the country, think about what you can do for your Country. Arm yourself with education, knowledge, skills and innovation to contribute for your nation. Thank you Brother Rediet for this educational and wonderful article. It a great awernes of environmental issues.